What's new in Revive Adserver v3.0.0? What’s new in Revive Adserver v3.0.0? Application name has changed from “OpenX Source” to “Revive Adserver”. Signup for an OpenX account is no longer required during installation. Removed plugins (OpenX Market and OpenX Workflow) related to the deprecated OpenX Market service. Fixed code injection exploit with delivery limitations (See note below). Update checking mechanism no longer supports sending aggregate statistic data to the update server. The code injection exploit deliver limitations fix requires user action to ensure that you are safe. After upgrading to Revive 3.0.0, you must take the following actions to ensure that all of your delivery limitations are not potentially exposing your system. Log into your Revive Adserver UI as an admin user. Ensure that you are “Working as” the system administrator. Go to “Configuration > Maintenance”. Select the “Delivery Limitations” section. Click the “Check ACLs” link. If errors are reported, click the “Recompile” button. Please note that in this event, it is possible that some banners will no longer deliver, as the injected code will render your re-compiled delivery limitations as invalid. To correct this, you will need to re-set the delivery limitations for each affected banner in the user interface. PHP 5.4+ now supported (See note below). Added support for the calculation of revenue and eCPM statistics for future delivery of monthly tenancy campaigns and associated banners. Added breadcrumbs to the statistics pages. Improved the delivery of contract campaigns by reducing the effect that linked, but inactive, zones have on the priority calculations, where impressions were being incorrectly allocated to these zones, resulting in under-delivery. Support for running Revive Adserver with modern PHP versions has been added, however due to a PHP garbage collection bug the code might not work properly in some circumstances and generate segmentation faults. The bug has been reported to the PHP team (https://bugs.php.net/bug.php?id=65367) and fixed in PHP 5.5.2; the bug is as yet unfixed in any versions of PHP 5.4. Update September 21, 2013: the bug we reported to the PHP team has been fixed in PHP version 5.4.20. Fixed upgrade wizard to ensure that that disabled plugins remain disabled after upgrade is completed. Fixed issue with magic macros not working in a banner’s destination URL when being displayed in an invocation tag with 3rd party click-tracking enabled. Fixed many different combinations of invocation tags failing to track clicks correctly in 3rd party servers. Fixed SQL banners on PostgreSQL. Fixed bug with multiple banner/zone ID logging. Fixed bug with non-transparent SWF banners being served without wmode=opaque, causing banners to be rendered on top of other dynamic content (e.g. menus). Resolved several PHP warnings relating to code strictness. Please note that bug fixes to 3rd party click-tracking mean that it is possible that existing, working 3rd party click-tracking configurations may break. Please see this note in our issue management system for more details on why, and what combinations of servers & tags may be affected. 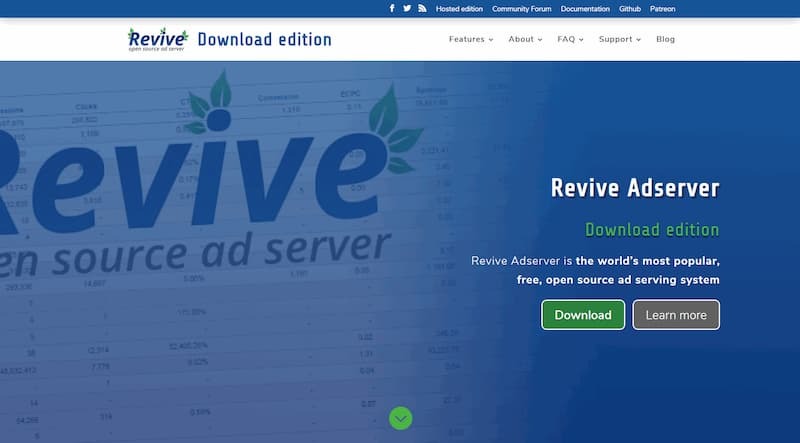 Revive Adserver v3.0.0 was developed by Andrew Hill and Matteo Beccati. The Revive Adserver Project Team thanks the following members of the community for their contributions to the code: Florian Sander and Erik Geurts. Download links for the new version are available on the Revive Adserver download page. Thank you for resurrecting OpenX Source. I’ve been using the software since it was Openads, and formerly PHPAds, and had lost hope in the product once it turned into a monetized solution (and the open source development ceased). I was reluctantly looking for an alternate solution (should I dare say Google DFP? *cringe*). So great to see the Revive Adserver project pressing forward! I just wish I had seen it sooner, as I could have made the upgrade over the summer. I’ll do what I can to help future growth and development. Time to plan out the upgrade for our ad server and hopefully everything will work smoothly, and as planned. Keep up the good work! Thanks again!